Stephen Cosgrove and Robin James collaborated on the 60-plus titles that comprise the Serendipity Books series, including such classics as Serendipity, Flutterby, Morgan and Me, and Leo the Lop. Stephen Cosgrove’s career has spanned more than 35 years with over 300 children’s books and 30 young adult novels. Born and raised in Washington State, he now lives in Austin, TX, where he continues his writing career. Robin James has illustrated more than 75 books, including all of the titles in the much-loved Serendipity series. A native of the Pacific Northwest, she lives with her husband in Snohomish, WA. The Wheedle has been snoring contentedly on the Needle for the past 30 years, when his peaceful slumber is rudely interrupted by a sad and insistent meowing. What happens next will surprise not only your little Wheedles, but all of us who would stare up at the Needle’s red light as kids…or wished we had. Find out what the power of friendship and plain old kitten cuddles will teach even the most curmudgeonly of creatures. 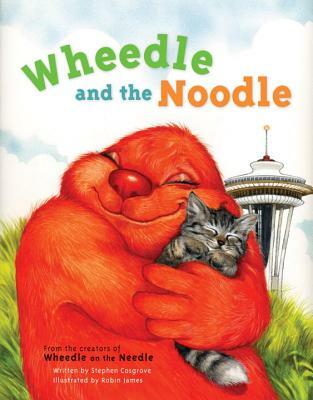 Nearly four decades afte furry creature Wheedle made his first appearance in Wheedle on the Needle, he returns in this charming book.